Last season, the AL West was once again all about the Los Angeles Angels of Anaheim. For the third straight season, and for the fifth time in six years, the Halos won the American League West behind the tutelage of Philadelphia-bred manager Mike Scioscia. They finished with 97 wins, 10 games ahead of second place Texas. The Rangers are another great story from 2009. No, they did not make the playoffs, but they did take strides toward that goal. Ron Washington has rallied the team from 75 wins in 2007 to 79 wins in ’08. Last years leap makes them a real threat in the West again this season. Seattle somehow won 85 games a year ago and are poised to continue growing. Oakland struggled to 75 wins, but the Billy Beane-led A’s will always hang around and play tough baseball. -The Angels lost ace starting pitcher John Lackey to the Boston Red Sox in free agency, but they are still well stocked with arms. Young Jered Weaver, who won 16 games a year ago, leads a steady bunch. Scott Kazmir, Joe Saunders, Ervin Santana, and Joel Pinero round out the solid rotation that will not wow you, but will produce. 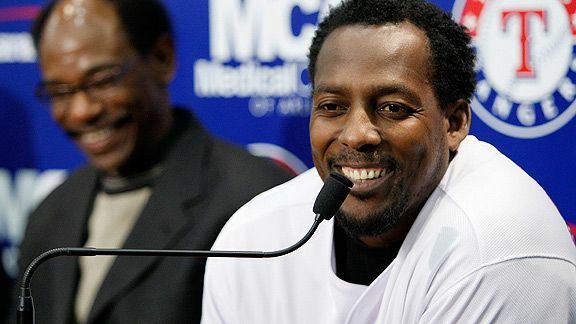 Offensively, they lost their heart and soul for the last six seasons, Vladimir Guerrero. He’s moved the the rival Rangers, but in his stead comes World Series hero Hideki Matsui to DH. One of the biggest losses in free agency for any team was Chone Figgins jumping ship to the Mariners, however, up-and-comer Brandon Wood, along with Maicier Izturis, will attempt to hold down the fort. The offense may struggled a bit without the presence of Figgins at the top of the order, but we all know Scioscia will have these guys prepared for anything. An exciting, offensive-laden team a year ago will return most of the same order that catapulted the Rangers to their best campaign in five years. They mostly did so without Josh Hamilton, who struggled with injuries and made it through 89 games. His return is paramount to the Rangers making yet another move up the West standings. Michael Young was as good as ever a year ago as he moved to third base, and he should continue to be the rock of the lineup. The pitching is the problem. Last year, they got huge output from Scott Feldman who won 17 games. Subtract former Phillie Kevin Millwood and add oft-injured flame thrower Rich Harden and the young staff is decent. But that all falls on youngsters Derek Holland and Tommy Hunter. Nefali Feliz is a possibility as a starter, but right now he’s in the bullpen and virtually unhittable as he hits the high-90’s with his fastball. In 2010, I think 90 wins is a possibility, but it all comes down to pitching. The offense will score enough, but can they continue to progress in the arms race. The Mariners were an enigmatic team in ’09. They figured out a way to win 85 games by scoring the least amount of runs in the American League (640). Seattle did allow the fewest runs in the junior circuit, but it’s still rather impressive that they won so many games with little to no offensive production. They did not have a 100-RBI guy in the lineup and this offseason lost their top power hitter, Russell Branyan, to free agency. Chone Figgins was their big pickup, so it looks like manufacturing runs is the mantra for 2010. Of course, they also have perhaps the greatest one-two punch in the majors at the top of their rotation. Felix Hernandez gets help from none other than Cliff Lee. But behind those stallions is a major question mark. Ryan Rowland-Smith, Doug Fister, and Ian Snell doesn’t really excite too many people. Their strength also needs to be the bullpen, the crew with the 3rd best ERA and 3rd best OPS against in the AL. To me, with no real power threat, it looks like the Mariners may be in for a regression. The Moneyball A’s continue to be frugal because they have to be. The last few seasons, it has meant a depleted product on the field. In 2009, their offense was borderline laughable and it looks to be the same this season. Ever heard of Cliff Pennington? He takes over at shortstop. Daric Barton, Ryan Sweeney, and Rajai Davis aren’t exactly household names, either, but it’ll have to do. They did add Kevin Kouzmanoff to take over at third base, but it probably won’t be enough. The pitching staff is the real plus on this team. A group led by Ben Sheets and Justin Duchscherer can either be outstanding and dominant, or will sink due to injuries. Brett Anderson, Trevor Cahill, and Vin Mazzaro round out the five-man crew. The bullpen is also young, yet solid, and for the A’s to have any chance in the AL West, they will have to pitch over their heads. Looks unlikely.